Peak Energy: Was Moore's Law Inevitable? 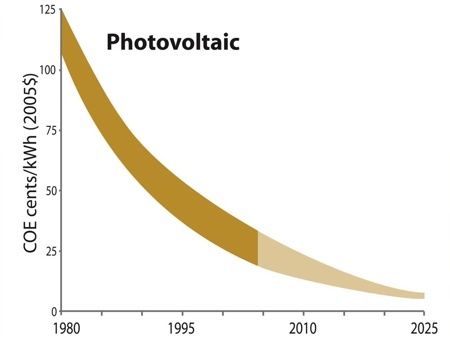 Kevin Kelly has an interesting (and long) article on the history of Moore's Law and exponential growth in technological capability, including some notes on its relevance for solar PV production - Was Moore's Law Inevitable?. Finally, in a another reference, Mead adds : "Permission to believe that [the Law] will keep going," is what keeps the Law going. Moore agrees in a 1996 article: "More than anything, once something like this gets established, it becomes more or less a self-fulfilling prophecy. The Semiconductor Industry Association puts out a technology road map, which continues this [generational improvement] every three years. Everyone in the industry recognizes that if you don't stay on essentially that curve they will fall behind. So it sort of drives itself." The " technology road map" produced by Semiconductor Industry Association in the 1990s was a major tool in cementing the role of Moore's law in chips and society. According to David Brock, author of Understanding Moore's Law, the SIA road map "transformed Moore's law from a prediction to a self-fulfilling prophecy. It spelled out what needed to be accomplished, and when." A major factor in semiconductor manufacturing process are the photoresist masks which craft the thin etched conducting wires on a chip. The masks have to get smaller in order for the chip to get smaller. Elsa Reichmanis is the foremost photoresist technical guru in Silicon Valley. She says, "Advances in the [process] technology today are largely driven by the Semiconductor Industry Association." Raj Gupta, a materials scientist and CEO of Rohm and Haas, declares "They" -- the SIA road map -- "say what performance they need [for new electronic materials], and by which date." Andrew Odlyzko from AT&T Bell Laboratories concurs: "Management is *not* telling a researcher, 'You are the best we could find, here are the tools, please go off and find something that will let us leapfrog the competition.' Instead, the attitude is, 'Either you and your 999 colleagues double the performance of our microprocessors in the next 18 months, to keep up with the competition, or you are fired.'" Gordon Moore reiterated the importance of SIA in a 2005 interview with Charlie Rose: "the Semiconductor Industry Association put out a roadmap for the technology for the industry that took into account these exponential growths to see what research had to be done to make sure we could stay on that curve. So it's kind of become a self-fulfilling prophecy." Clearly, expectations of future progress guide current investments. The inexorable curve of Moore's Law helps focus money and intelligence on very specific goals -- keeping up with the Law. The only problem with accepting these self-constructed goals as the source of such regular progress is that other technologies which might benefit from the same belief do not show the same zooming curve. We witness steady, quantifiable progress in other solid state technologies such as solar photovoltaic panels -- which are also made of silicon. These have been sinking in performance price for two decades, but not exponentially. Likewise the power density of batteries has been increasing steadily for two decades, not again, no where near the rate of computer chips. Why don't we see Moore's Law type of growth in the performance of solar cells if this is simply a matter of believing in a self-fulfilling prophecy? Surely, such an acceleration would be ideal for investors and consumers. Why doesn't everybody simply clap for Tinkerbelle to live, to *really* believe, and then the hoped for self-made fairy will kick in, and solar cells will double in efficiency and halve in cost every two years? That kind of consensual faith would generate billions of dollars. It would easy to find entrepreneurs eager to genuinely believe in the prophecy. The usual argument applied against this challenge is that solar chips and batteries are governed primarily by chemical processes, which chips are not. As one expert put the failure of exponential growth in batteries: "This is because battery technology is a prisoner of physics, the periodic table, manufacturing technology and economics." That's plain wrong. Manufacturing silicon integrated chips is an intensely chemical achievement, as much a prisoner of physics, the periodic table and manufacturing as batteries. Mead admits this: "It's a chemical process that makes integrated circuits, through and through." In fact the main technical innovation of Silicon Valley chip fabrication was to employ the chemical industry to make electronics instead of chemicals. Solar and batteries share the same chemical science as chips. If you scour the technium for examples of enduring exponential progress, you'll find most candidates within fields related to material science. For instance the maximum rotational speed of an electric motor is not following an exponential curve. Nor is the maximum miles-per-gallon performance of an automobile engine. In fact most technical progress is not exponential, nor steady. Even most progress in material science is not exponential. We are not exponentially increasing the hardness of steel. Nor are we exponentially increasing the percentage yield of say, sulfuric acid, or petroleum distillates, from their precursors. The first thing to notice is that all these examples demonstrate the effects of scaling down, or working with the small. In this microcosmic realm energy is not very important. We don't see exponential improvement in efforts to scale up, to keep getting bigger, skyscrapers and space stations. Airplanes aren't getting bigger, flying faster, and more fuel efficient at an exponential rate. Gordon Moore jokes that if the technology of air travel experienced the same kind of progress as Intel chips, a modern day commercial aircraft would cost $500, circle the earth in 20 minutes, and only use five gallons of fuel for the trip. However, the plane would only be the size of a shoebox! We don't see a Moore's Law-type of progress at work while scaling up because energy needs scale up just as fast, and energy is a major limited constraint, unlike information. So our entire new economy is built around technologies that scale down well -- photons, electrons, bits, pixels, frequencies, and genes. As these inventions miniaturize, they reach closer to bare atoms, raw bits, and the essence of matter and information. And so the fixed and inevitable path of their progress derives from this elemental essence. Power consumption. The power consumption of computer nodes doubles every 18 months. The Great Moore's Law Compensator (TGMLC) generally referred to as bloat, is the principle that successive generations of computer software acquire enough bloat to offset the performance gains predicted by Moore's Law. In a 2008 article in InfoWorld, Randall C. Kennedy, formerly of Intel introduces this term using successive versions of Microsoft Office between the year 2000 and 2007 as his premise. Despite the gains in computational performance during this time period according to Moore's law, Office 2007 performed the same task at half the speed on a prototypical year 2007 computer as compared to Office 2000 on a year 2000 computer. 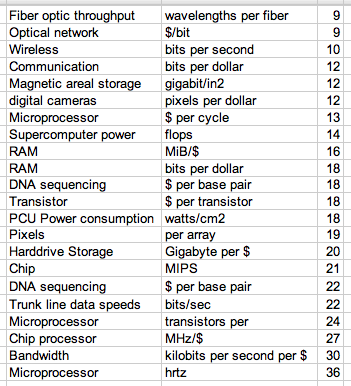 But the importance of Moore's Law, which does not address chip performance, is limited. The incremental performance gains now achieved by regularly doubling the number of transistors on a chip, such as a desktop microprocessor, aren't as significant as they used to be. This is the law of diminishing marginal returns, an economic law that states the marginal return on a unit of input decreases as more inputs are added. That theory guided the design of semiconductors for 30 years and beyond the 1-micron mark, until chip makers began using the 130-nanometer production process and classic scaling practices ran into a brick wall, Meyerson said. At that point, chip makers could no longer scale some transistor features and power consumption rose sharply, he said. Increased power consumption resulted in chips that generated too much heat for some applications, Meyerson said. "By following Moore's Law in the absence of correctly scaling the device, you get a dense chip you can't correctly use," he said. The relationship between increased performance and greater density basically ended somewhere around 130 nanometers, leaving chip makers to seek out other ways of improving performance, Meyerson said. One solution is to put multiple processor cores, each using a lower clock frequency, on a single chip, he said. That's exactly what Intel has done with the latest addition to its desktop processor line.